Red borders and blocky white text must mean TCMA's back in town! 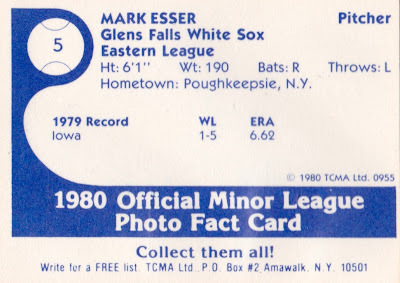 Today's set marks an encore performance for Chicago's AA team in Glens Falls, a franchise that started 1980 with a black-and-white set, whose #5 was shadowy Mark Platel. I assume that offering proved popular enough to merit this mid-season bump to full color. 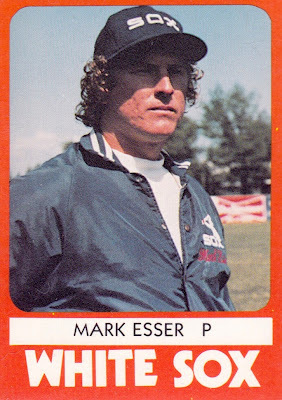 1980 was also a busy year for Esser, who'd started 1979 with Chicago's White Sox after doing great things against single-A hitters in 1978. He lasted less than a month on the South Side, pitching 1.2 innings, garnering a 16.20 ERA, and striking out one batter (Dave Roberts) before being sent down to the AAA Iowa Oaks, where he was managed by young (34 year-old) manager Tony LaRussa. LaRussa built his strategic reputation on revitalizing pitchers in Oakland and St. Louis, but Tony didn't do much for Mark, who unfortunately never made it back to the bigs. Based on 1979's stats in Iowa, I suspect a minor but lingering injury that didn't improve until the off-season. Esser broke 1980 spring training with single-A Appleton, probably a kick in the gut when you'd started on a major league roster the previous year. Mark once again blew away low-minors competition, going 4-0 in 5 starts, then jumped to both AA Glens Falls (today's card) and AAA Iowa with mixed results. He spent 1981 in denouement, then pitched a final year with Glens Falls before retiring (career stats). TCMA printed 30 cards for this color set, adding #20 "Sox Infield" to the black-and-white version's 29 player checklist. Players in bold reached the majors. Find scans of most of the set on Auctiva, an image hosting site. Wish I could go back in time and tell those photographers to stop taking players photos at noon. Value: 1980 TCMA cards remain easy to find, so $1-2 for non-star singles is reasonable and team sets run $10-15. Fakes / reprints: TCMA reprinted several team sets for "collector's kits" in the late 1980s. Reprints come with black ink backs and originals have blue ink.